Galvanized alloy trailers live a hard life dealing with regular dunkings in harsh seawater and constant exposure to the elements. It's just a matter of time until rust and corrosion takes hold. 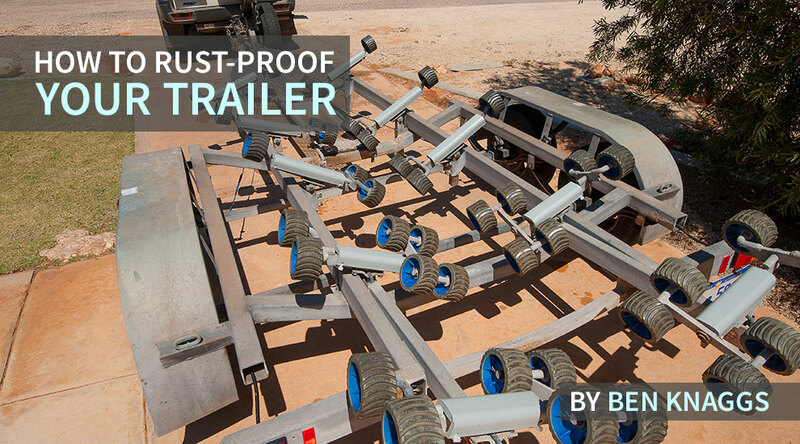 When this occurs, it's time to take preventative action to extend your trailer's working life. At first glance this 10-year-old alloy trailer doesn't appear to be in very bad condition, but on closer inspection it's clear that rust and corrosion is beginning to accumulate in many places. If this is not dealt with, the trailer may be ready for the scrap heap in just a few more years. 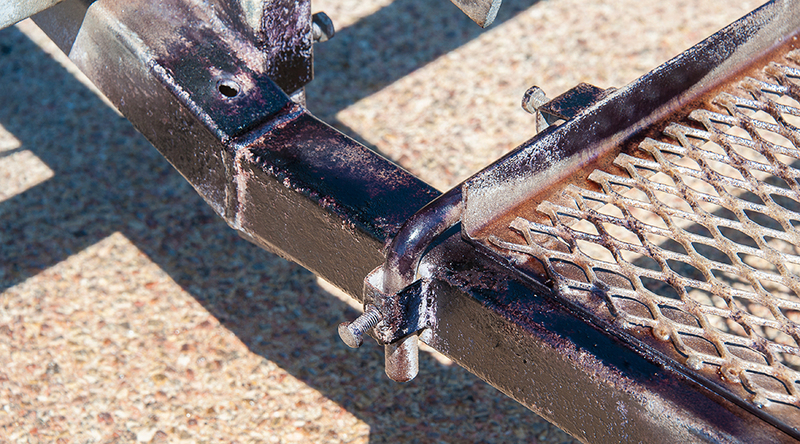 The first step to dealing with rust is to give the trailer a thorough cleaning. A solid wash down with a pressure washer will get rid of accumulated salt, sand and road dust. Now for the time consuming part... You need to strip away the surface rust and corrosion, but not so much that you eat into of what is left of the original galvanizing. 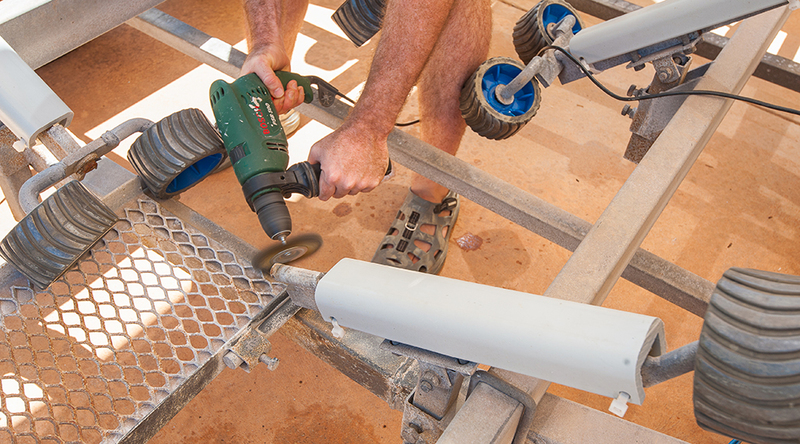 A wire brush attachment for your electric drill is just right for this purpose. 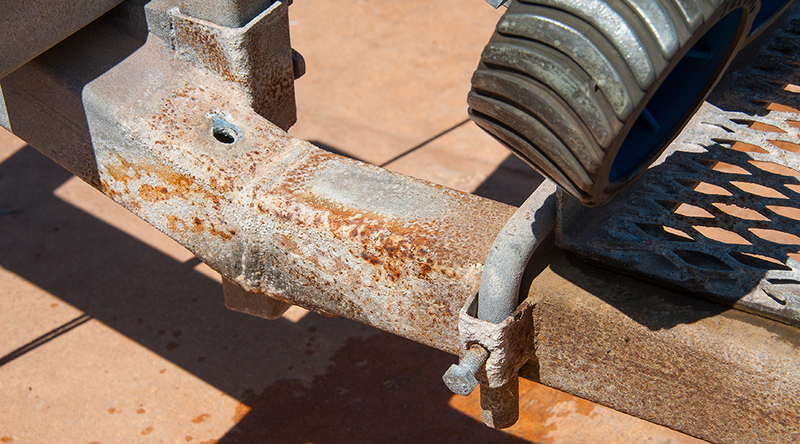 Typically, the areas worst affected by rust will be those that are hard to reach when washing. 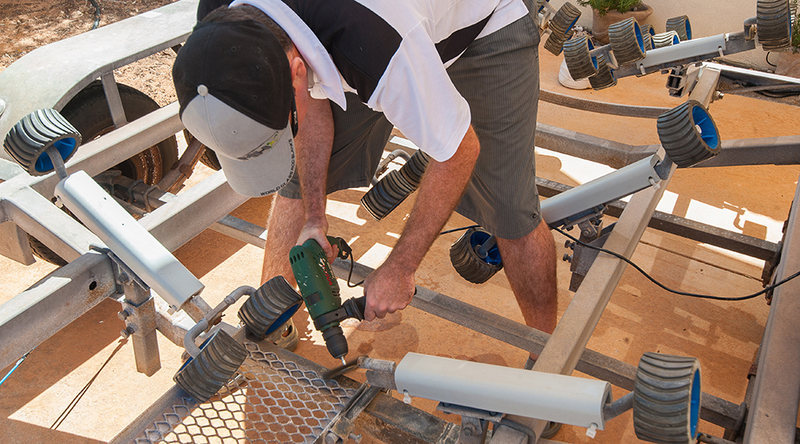 These same spots can be difficult to get to with the wire brush, so it's worth investing in a few various sized and shaped drill attachments to make this job easier. With the trailer all clean and prepped, it's time to apply the rust proofing. This is a three-step process, the first of which treats the alloy with a rust converter. This chemical converts the surface rust into 'Ferric Tannate,' creating an insoluble layer that will inhibit further corrosion. You can find these products online, at marine stores and home improvement stores. Read the directions on the rust converter you purchase and make sure to let it penetrate the surface rust and do its job. Most products need to cure overnight. Once the chemical reaction takes place, the remaining surface will turn a deep purple-black color. 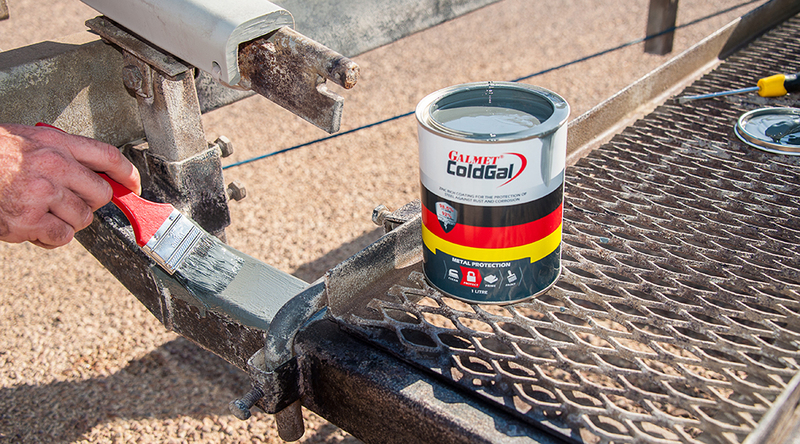 After rinsing or wiping off the rust converter residue, a cold galvanizing paint can be applied (either with a brush or spray gun). The paint acts as the primary barrier protecting the metal. For those who like the polished steel look, note that this paint is available in a metallic a finish. For this job though I'm going for the traditional battleship grey. Once the paint is dry, finish off with a final light layer of waterproof, lanolin-based corrosion inhibitor and the job is done. 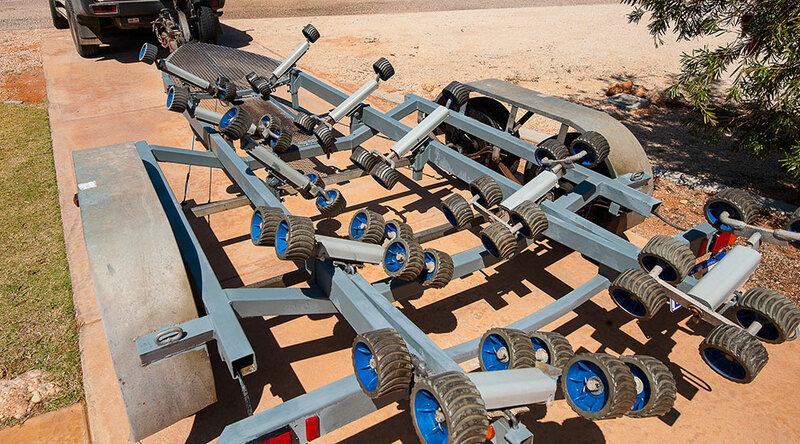 Note that since this trailer is a multi-roller/drive-on version, you do not want to paint any moving or high-wear parts. It's best to just use the rust convertor and corrosion inhibitor on these areas and skip the final coat. 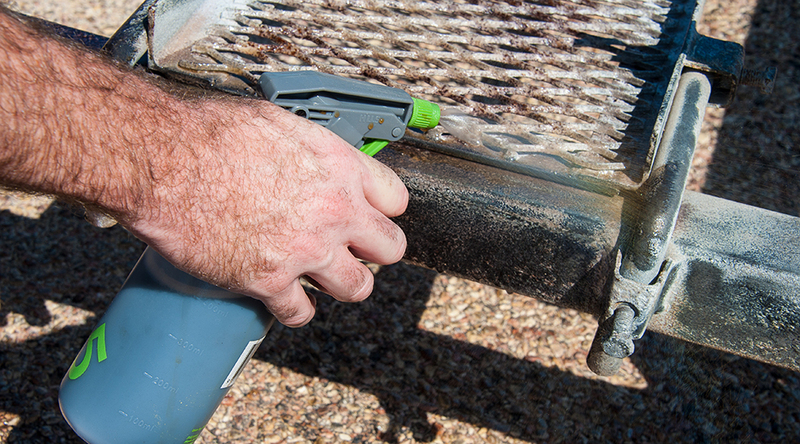 Once your final coat is done, you can count on at least 10 more years of corrosion free service.